When you're short on time and your carpet needs refreshing use Big D Carpet Freshener to quickly remove unwanted odors from carpet and rugs with no vacuuming! Simply apply this aerosol foam to the desired area and watch and wait while the foam magically disappears taking with it any stale/musty odors that were present. 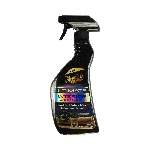 Stubborn odors such as pet odors, tobacco, food are eliminated with one easy application. Best of all, Big D Carpet Freshener is a true Big D deodorant that will eliminate odors from any source that may be trapped in carpet fibers.